Sure enough, a few hours into the game and young unknown Jack McCall enters the saloon. 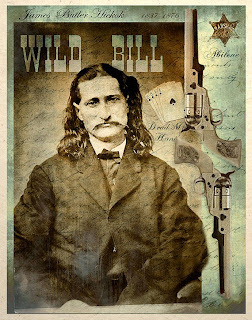 Without a word he draws his gun, and fires a fatal shot to Wild Bill’s head. 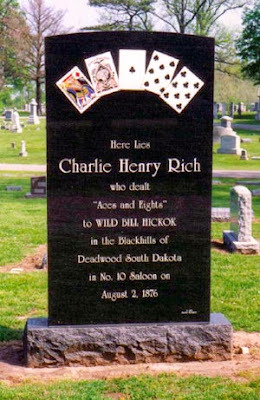 As Robert Rath rightly says, Wild Bill’s luck ran out that day, but the last hand he held while dying was to become as legendary as the man himself. Dead Man’s Hand – the ace of spades, the ace of clubs, the eight of spades and the eight of clubs. Robert quickly and cleverly draws us into the story with panels of illustrations telling the story of what Wild Bill did that fateful day during the final hours of his life. 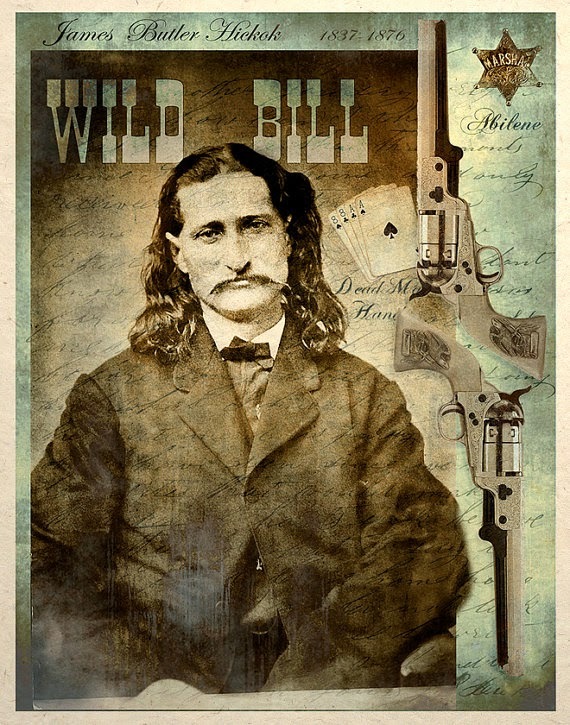 Bill and the other characters are brought to life through realistic drawings with harsh, sharp lines that bring out the cruel, ruthless life of the Wild West. The panels flow smoothly, supporting the story and are only interrupted to give Bill’s background story and how he got his name. Some might argue that this breaks up the flow, but this is not the case. Instead, it helps build up suspense. Throughout, the layout cleverly leads the reader through the story and the word bubbles fit into the composition perfectly. The thickness of the panels doesn’t distract from the main illustrations either; something that Robert Rath has been noticed for in the past. His use of colour is interesting, sticking to brown and yellow hues and almost dirty shading. 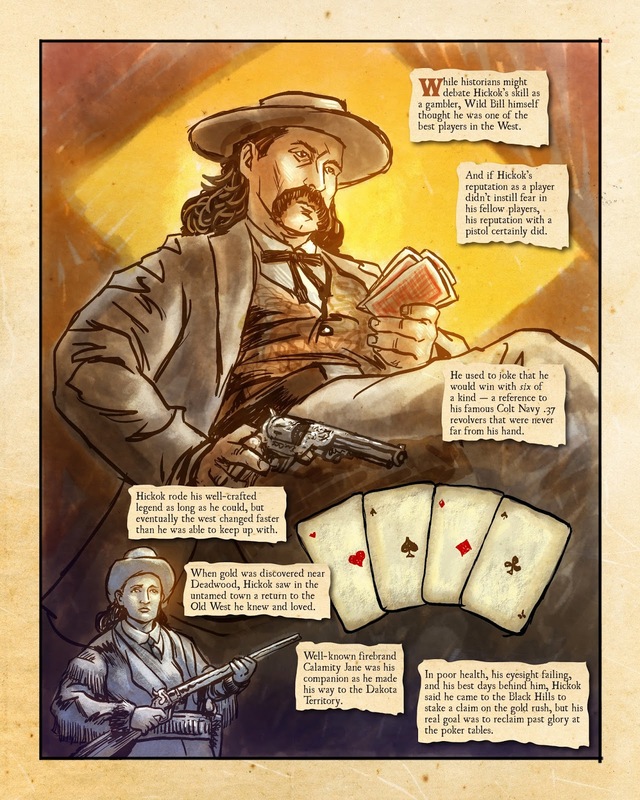 Other colours are used sparingly but with effect, like the grey/white of the people who aren’t part of the story, used for his admirer, General George Custer, and his companion, Calamity Jane. Brighter tones are used for the lamplight, the black and red of the playing cards, and the bright red of the spattered blood after McCall kills Bill. In recent years, it’s been difficult to find a Western comic that hasn’t leaned over to the ‘dark side’ – introducing supernatural beings and monsters. Among the few notable exceptions is Jonah Hex. 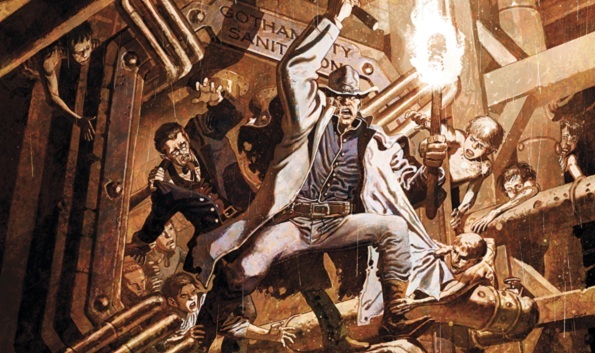 Jonah Hex, is a hardened bounty hunter who appears to be the opposite of Bill. But look a little closer and you see a man who wants to protect the innocent; not a million miles away from Bill Hick’s law keeping days. Like Dead Man’s Hand, the artwork on Jonah Hex is fantastic. The most striking thing about him is, like Bill, he looks real. He looks exactly like you would imagine him to. With his harsh face filled with lines and shadows. Admittedly one could argue the likeness ends there. Jonah’s illustrator has made more use of colour and his character doesn’t have the same ruggedness as Wild Bill. Nonetheless, it has as equally a striking effect; colour or none, it’s the realness of both characters that stands out to be noticed.